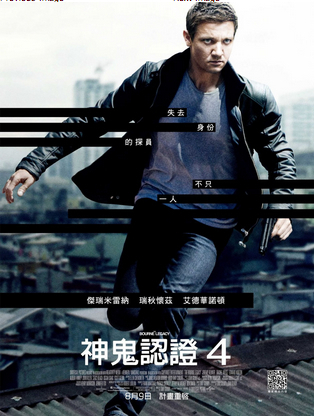 Tony Gilroy’s The Bourne Legacy surprised China box office watchers last week, outpacing most analysts’ estimates as it chased down a solid $14.4 million box office haul in its 4-day opening in the PRC. 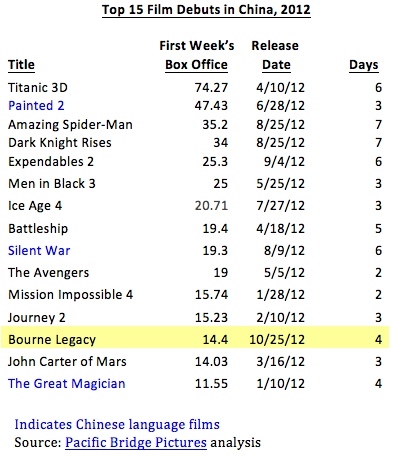 The debut ranked as the 13th best in China this year, just ahead of the $14 million March opening of John Carter, and just behind Journey 2’s $15.2 million February open. With Bourne, foreign films sustained their post blackout dominance at China’s theaters, as the week’s top 5 slots were colonized by English language pictures—four of American origin and one Australian. Fully 88 percent of the frame’s revenues went to non-Chinese movies. Cumulative weekly revenues were $36 million, 50 percent better than the total for the same week last year. Chinese audiences again demonstrated that, in the absence of SARFT manipulation, they strongly prefer imports over domestic pictures. Hollywood films tend to wind up their runs in the PRC with 2.5 times to 3.5 times their opening 3-4 day weekend tallies, so Bourne will likely finish its run in the $35 million to $50 million range. China should ultimately account for 12 to 15 percent of the picture’s worldwide theatrical gross, which would be on par with several of the 2012’s best performing Hollywood releases in China, such as The Expendables 2, which earned about 15 percent of its worldwide total there, and Men in Black III, which took 13 percent of its worldwide gross there. Considering that it released in the rest of the world nearly a year ago, the $3.6 million opening of Twilight: Breaking Dawn Part I was a reasonably good one and a credit to disrtibutor DMG’s strength in the market. The next Hollywood film debut will be on November 6th, when Disney’s animated family feature Wreck-It Ralph opens as counter-programming against the star-studded Hong Kong cops and robbers thriller Cold War, which features Aaron Kwok, Tony Leung, Andy Lau and Dear Enemy’s Aarif Lee. No other film looks likely to make much of an impact through mid-November, so foreign films should enjoy several more good weeks in China until the December blackout begins. This entry was posted in Box Office Reports and tagged Aarif Lee, Aaron Kwok, Andy Lau, Bourne Legacy, Rob Cain, Robert Cain, Tony Gilroy, Tony Leung, Twilight: Breaking Dawn I, Wreck-it Ralph by chinafilmbiz. Bookmark the permalink.